"By the reasoning of this article, if a rock rolled down a hill three million years ago, no human can be responsible for rolling a rock down a hill today. The fallaciousness of this reasoning is astounding. It is hard to imagine that a well-intentioned person can so profoundly misunderstand the science. Assuming the author is acting in good faith, this article provides evidence that motivated reasoning can produce results that appear delusional to well-informed people." 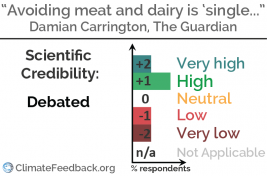 "What would make their case stronger would be if they actually analysed all the data, engaged with the existing scientific literature and made their own contribution to our scientific understanding by publishing a scientific paper. The cherry picking exercise in this Western Journal article does not contribute to our scientific understanding of the world." This story in The New York Times covered the October release of the IPCC's "Global Warming of 1.5 °C" report. Scientists who reviewed the story found that it provided an accurate and detailed summary of the report, though some statements about warming being "worse than previously thought" could have used some clarifying context. "The word “Avoiding” in title and text is overly strong and should have been “Reducing”. Adopting a vegan diet is not necessary, but a reduction to having meat 1-2 times a week and dairy 3-4 times a week would suffice. In fact, flexitarian diets utilize natural resources much more efficiently than vegan diets. In the article, Peter Alexander is quoted saying something to the same effect." 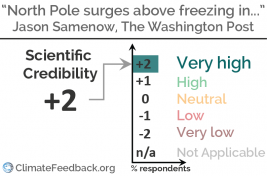 "The comments from the members of the Committee suffer from severe inaccuracies and misconceptions, and citations of the invited climate scientist mostly address those issues. In general, the views that go against our understanding of the climate change process are underlined and presented as such by the author, but rarely supported by statements or explanations that go beyond the immediate replies from the invited climate scientist. Some of the inaccurate statements quoted in the text are thus left with an incomplete challenge." 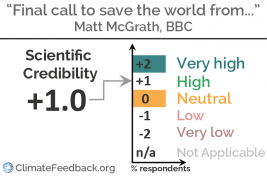 "Scientifically, the article is overall correct, but it is in cases inaccurate in its description of certain aspects of the IPCC. For example, the IPCC does not conduct research, but assesses the available scientific evidence. The article also provides statements without context, despite this being essential for their interpretation." 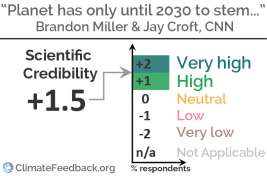 This CNN story covered the October release of the IPCC's "Global Warming of 1.5 °C" report. The report, which was requested by governments during the 2015 Paris Agreement negotiations, details the impacts of 1.5 °C compared to 2 °C and the emissions cuts required to limit warming to either of those levels. 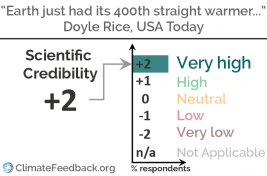 Scientists who reviewed the story found that it conveyed the information in the report without any errors, and included comments by scientists to summarize the report's implications. "The piece accurately reports the surface temperature record warming of recent decades and joins the dots appropriately to the underlying cause of human emissions. It appropriately draws the distinction between regional/national records and the global mean behaviour. The included quotes are to authoritative sources." "This article accurately describes the Arctic warming event and associated surprise by scientists, includes multiple explanations for possible causes, and does not overstate any connections to climate change, pointing out that more data is needed to know if these above-freezing events will be a new Arctic normal." 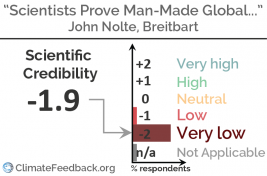 "The video presents a litany of the usual climate denier talking points, none of which hold any water. It is full of outright false claims and does not even shy away from presenting a fake TIME magazine cover that supposedly warned of an ice age. 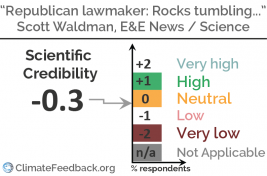 “Friends of Science” is an advocacy group “largely funded by the fossil fuel industry”"